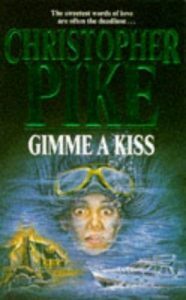 Christopher Pike’s Gimme a Kiss is only 122 pages long and so it is probably better classed a novella than a novel. I found this book in the horror section of our local bookshop, but I do not creally consider Gimme a Kiss a horror story. I think it is more of a mystery, even if it does have it does have its darker moments. Gimme a Kiss is a story of friendship and young love. And young love gone wrong. Not to forget consequences. There are always consequences. Most of the bad things that happen to the characters in this story are a result of someone reading someone else’s diary. Worse still, not only did the person in question read the diary, but they photocopied it and passed the copies around the school. No one wants their most personal thoughts and dreams to become public knowledge, yet that is exactly what happened to Jane Retton, and Jane had written some extremely personal things in her diary; so it is not surprising that there are consequences. Gimme a Kiss wasn’t exactly what I expected it was going to be, but I soon got hooked into the story. I read the whole thing in just a few hours, stopping half way through the book, trying to figure out what was happening behind the scenes, who was dead and who just might not be dead at all. I came up with some ideas but most of my ideas were wrong. Gimme a Kiss is a clever story, but I must admit that there was one little thing, right near the conclusion of the book, that I found a little daft. I can’t say here what that thing was, because I don’t want to give anything away for those who might decide to read the story themselves. Anyone who does decide to read it will perhaps pick up on the thing I mean. I just can’t believe that any girl who is the age of the one in question, would believe the what that this one did. Sorry if I am being mysterious here, but it is a mysterious story. I already told you that. I’ve said all I’ve got to say and am saying no more.